looks like a luscious candy of spun sugar in a beautiful cellophane and gold foil wrapper. 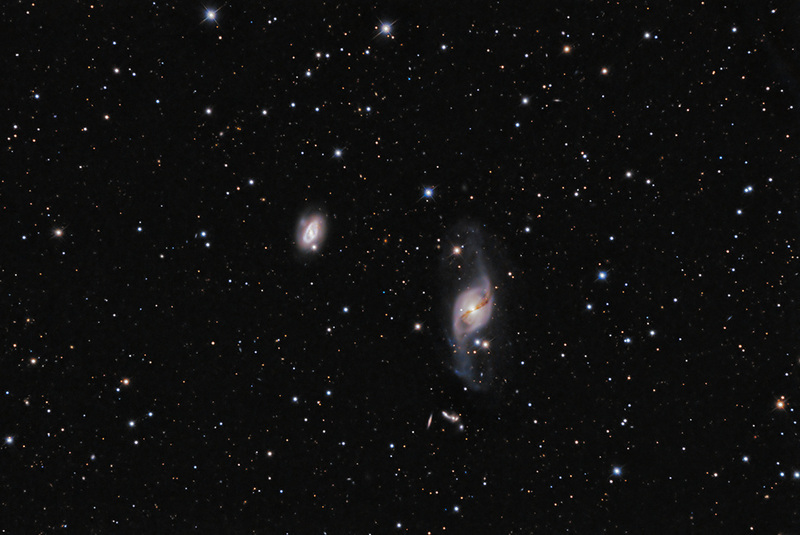 Although separated by 150,000 light-years, 3718 and its smaller companion NGC 3729 at left, orbit one another. 3718 is also number 214 in the Arp Atlas of Peculiar Galaxies, peculiar because of its S-shaped disk, indicative of violent warping due to the gravitational influence of 3729 of which precious little is written. NGC 3718's central dust lane is 80,000 ly long. Below 3718 at 7 o'clock is a group of five interacting galaxies designated Arp 322/Hickson 56, approximately six times further away from us.